Reason is for choosing PhoneGap’s open web standards developers with existing web skills, frameworks, tools and technologies can easily grasp the functionality. PhoneGap development with the customized app development. The reason is that a cloud-based service and every applications developed with the latest SDK for the targeted platforms. 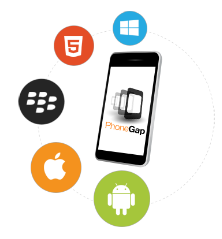 PhoneGap supports multiple platforms like iOS, Android, Blackberry, Widows Phone and webOS. Testing and Porting to iPhone, Android, Blackberry and Windows Phone. PhoneGap platform supports the cross platform app development so that app can be easily navigate in any Android, iOS, Blackberry, Windows Phone as well in webOS. Apps developed in PhoneGap supports Native App Functionality. Low development cost as well code reusability and its turn around into high ROI. Wider audience without spending a treasure. Axis Technolabs owning a enough professionals for PhoneGap App Developers and deliver the best applications to our clients. We are welcoming for discuss any related projects and utilize our company’s efforts to meet your business goals.